When Maria Hines decided to open a new restaurant in Ballard, she asked her friend Claire Barnett, owner of Seattle Mosaic Arts here in Wallingford, to design, create, and install a mosaic on the kitchen’s stainless steel oven. Given the restaurant’s open kitchen floor plan, the 26 square foot mosaic will be seen by anyone sitting at the bar or dining at a table facing the kitchen in the Golden Beetle. I met with Christina Vaule–one of the four women in the studio who have been working on the mosaic since early December, and she pointed out the four mosaic panels that were propped up against the studio’s front desk. The mosaic is made up of rich hues of blue with deep red vertical lines and beautiful golden paths horizontally woven into the pattern. The project has been a real group effort; the core team is made up of Claire, Christina (the studio’s creative director), Emily Margherio (the studio manager), and architect/designer Alexandra Immel. Several other studio members and supporters—Gayatri Marx, Beth Braun, Marjorie Mazie, and Mark Malamud–helped with much of the mosaic work and final parts of the process. On Wednesday of this week, the team installed the mosaic and on Thursday, they returned to the restaurant to do the final step in the process–grouting the tiles using a gray colored epoxy grout. The project is Seattle Mosaic Arts’ largest commission to date, and it has been both exciting and challenging. Because the restaurant is set to open in mid-February, and there is still much to do inside, Maria asked that the mosaic be installed this week, which had the studio working countless hours to come up with a design, create a template, order enough tiles before the holidays, cut many of the tiles in half and cut up sheets of stained glass to get the size they wanted for the design, and finally lay the tiles in place. There are six panels in all–two on each side of the oven and two little panels underneath the oven door. 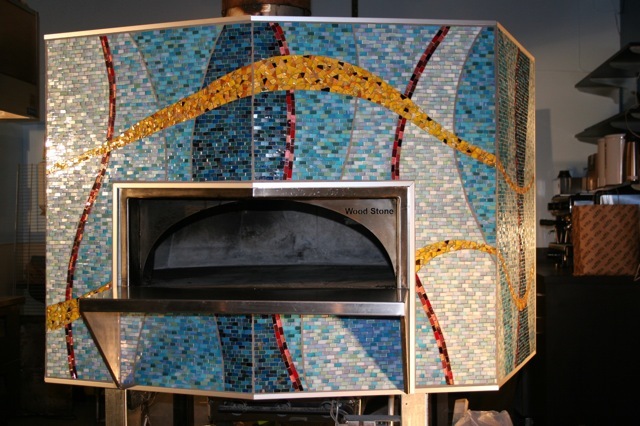 The tiles were mounted onto a 1/2″ thick cement board, which was then taken to the restaurant and screwed onto the oven by Mark Holmberg of Nice Guy Remodeling –a general contractor who lent his services to Seattle Mosaic Arts. The cement board install was kind of a “dry run” to allow the designers to see exactly where the screw holes would be in the design and make sure they’d cut the cement board to the correct size, and once all of cement board was screwed into place, it was then dismounted and brought back to the studio. There are approximately 12 screw holes in each of the four large panels and mosaic tiles will cover each hole after the panels are screwed onto the oven. Asked if the studio would be interested in doing another commission of this size, Christina replied with a smile and said, “Absolutely!” We look forward to seeing the mosaic in the Golden Beetle when it opens in mid-February. Meantime, have a look at the slideshow below that shows the project’s progression. What a great idea! Looks lovely. Congratulations SMA on such a beautiful first architectural installation. May there be many more in your future!